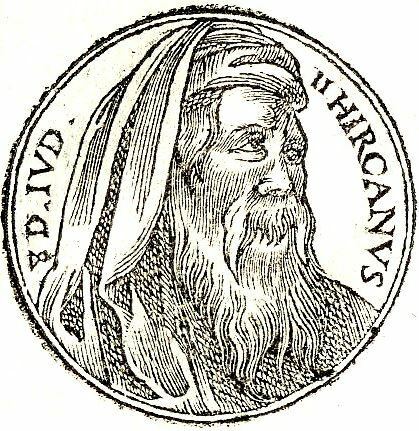 John Hyrcanus II was for a long time the Jewish High Priest in the 1st century BCE. He was also briefly King of Judea 67–66 BCE and then the ethnarch (ruler) of Judea probably 47–40 BCE. Hyrcanus was the eldest son of Alexander Jannaeus, King and High Priest, and Alexandra Salome. After the death of Alexander in 76 BC, his widow succeeded to the rule of Judea and installed her elder son Hyrcanus as High Priest. Alexander had numerous conflicts with the Pharisees. So Hyrcanus was believed to be supported by the Pharisees, especially later in his tenure. When Salome died in 67 BC, she named Hyrcanus as successor to the Kingship as well. Hyrcanus had scarcely reigned three months when his younger brother Aristobulus II rose in rebellion. The brothers met in battle near Jericho and many of Hyrcanus' soldiers went over to Aristobulus II, and thereby gave the latter the victory. He was reinstated as a puppet ruler by Julius Caesar when Judea came under Roman rule.